It’s not too far into February, so I figured I’d list many of the events going on in February that you might want to check out. Tomorrow night (2/8), MSU’s Black Poet Society will be stopping by The Advantage Takeover to perform some uplifting and inspiring poetry. 7:45pm In Conrad Hall at MSU. 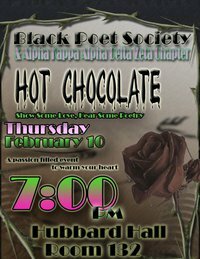 Thursday night (2/10), MSU’s Black Poet Society, with the help of Alpha Kappa Alpha Sorority, will be doling out some warm drinks and poetry at our “Hot Chocolate” event. This is our main event for February, so be sure to come on out and support us. Friday night (2/11), Ignite Lansing is taking place at the Capital Region International Airport. The event can be summed up as a bunch of people giving short talks on topics they feel passionate about. Saturday night (2/12), the Lansing Derby Vixens will be hosting a bout at the Lansing Center. Doors open at 6pm and the ladies will go flying around 7pm. I’ve got a couple coworkers that skate and referee for the Derby Vixens, so be sure to come out and show some love. Saturday, February 19, is MobiDevDay Detroit. The event was started to educate Detroit and Southeast Michigan software developers about building applications on mobile platforms. That rounds out my list of events for February. Do you know of an event that I missed? The poetry slam design was a great idea. To keep the format in a “top ten countdown” style, we started with six poets. Then the top three moved on to the second round. From there, the best poet performed one more piece. This design made for 10 performances, all increasing in quality. I want to give a shout out to Terrance Grantham and Kenya Abbott Jr. as they were the hosts for the night (playing the role of AJ and Free). We had about 200 people show up, and we know we’ll see a lot of familiar faces at our next event. I recorded most of the performances and have embedded them below. The event ended in a tie and the two winners were @MACKdaPOET and @DeonteOsayande. Mack is a new member of the Black Poet Society, and Deonte is real involved with the Detroit slam poetry scene. MSU’s Black Poet Society never stops! I’ve been uploading even more videos of MSU’s Black Poet Society on to YouTube. Since the last time I’ve put up a blog entry, we have had a slam competition in Hubbard Hall, an event with Def Poet Gemineye, and our weekly meetings with Open Mic sessions at the end of each meeting. Today was another great SpitFire Poetry at (SCENE) Metrospace in East Lansing. I shot some videos and have posted them below. The winner of the poetry slam was none other than Ralph Paulk, who was featured on the Jan. 31st post and this post as well. There are six new videos in this post. Be sure to watch them all. I recorded a couple poets performing at today’s meeting and have embedded them below for your viewing pleasure. Our meetings are held every Sunday at 6:30pm in the basement of the MSU Student Union inside of the Multi-Cultural Center. You are currently browsing entries tagged with Poetry at JAWS.